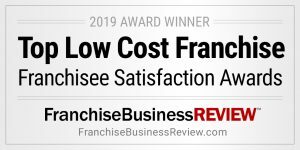 Greenwood Village, CO, April 11, 2019 – Payroll Vault was identified by independent franchisee satisfaction research firm, Franchise Business Review, as being one of only 97 franchises to qualify for its 2019 Top Low-Cost Franchises list. Brands on the list had to have high franchisee satisfaction and an investment of under $100,000 at the time their franchisees participated in Franchise Business Review’s survey. Payroll Vault franchisees were surveyed on 33 benchmark questions about their experience and satisfaction regarding critical areas of their franchise systems, including training & support, operations, franchisor/franchisee relations, and financial opportunity. Payroll and Human Capital Management services are growing requirements for small businesses. Payroll Vault Franchising offers the opportunity to own a boutique-style full-service payroll company supported by a team of experts and a nationally recognized brand. Franchisees are trained on business best practices and provided systems and strategies to operate a payroll business in an increasingly in-demand industry. As a professional services B2B business you’ll experience: Recurring monthly, quarterly and annual revenue – annuitized revenue, no accounts receivable, and the ability to scale from one location. From the franchise launch in 2012, Payroll Vault Franchising has rapidly grown as a result of exemplary client service and is an industry leader receiving numerous accolades and awards nationally. For more information, visit PayrollVaultFranchise.com.